Her married name became Myddelton-Biddulph. He was given the name of Richard Myddelton-Biddulph at birth.1 He lived at Chirk Castle, Denbighshire, WalesG. [S4785] Jill Arscott, "re: Dyson Family," e-mail message to Darryl Roger LUNDY (101053), 14 August 2010. Hereinafter cited as "re: Dyson Family." Her married name became Marshall. [S1070] David Hall, "re: Sir Frederick Marshall," e-mail message to Darryl Lundy, 5 April 2004 and 28 April 2005. Hereinafter cited as "re: Sir Frederick Marshall." [S6] G.E. Cokayne; with Vicary Gibbs, H.A. Doubleday, Geoffrey H. White, Duncan Warrand and Lord Howard de Walden, editors, The Complete Peerage of England, Scotland, Ireland, Great Britain and the United Kingdom, Extant, Extinct or Dormant, new ed., 13 volumes in 14 (1910-1959; reprint in 6 volumes, Gloucester, U.K.: Alan Sutton Publishing, 2000), volume XIII, page 26. Hereinafter cited as The Complete Peerage. Arthur John Riddell was born on 27 December 1869. He was the son of Francis Henry Riddell and Ellen Blount. He died on 17 April 1888 at age 18. Her married name became Stafford-Jerningham. After her marriage, Julia Barbara Howard was styled as Baroness Stafford on 4 October 1851. He held the office of Member of Parliament (M.P.) 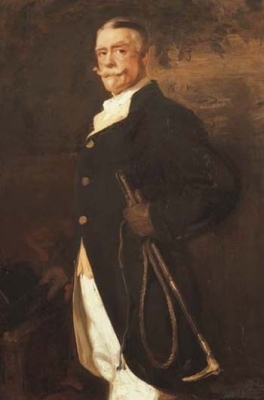 (Whig) for Pontefract between 1830 and 1835.1 He succeeded as the 9th Baron Stafford, of co. Stafford [E., 1640] on 4 October 1851.1 He succeeded as the 8th Baronet Jerningham on 4 October 1851. From 13 September 1859, her married name became Stafford-Jerningham. After her marriage, Emma Eliza Gerard was styled as Baroness Stafford on 13 September 1859. From 24 April 1887, her married name became Fitzherbert. [S155] Peter Townend, editor, Burke's Peerage and Baronetage, 104th edition (London, U.K.: Burke's Peerage Ltd, 1967), page 1461. Hereinafter cited as Burke's Peerage, 104th ed. [S5345] Renee Gerard, "re: Gerard Family," e-mail message to Darryl Roger LUNDY (101053), 30 April 2011. Hereinafter cited as "re: Gerard Family."